Here we have a newly acquired old picture postcard. This photographic postcard is of a mill in Gheluwe, in the Flanders region of Belgium. See also our section on Windmills in Old Pictures. 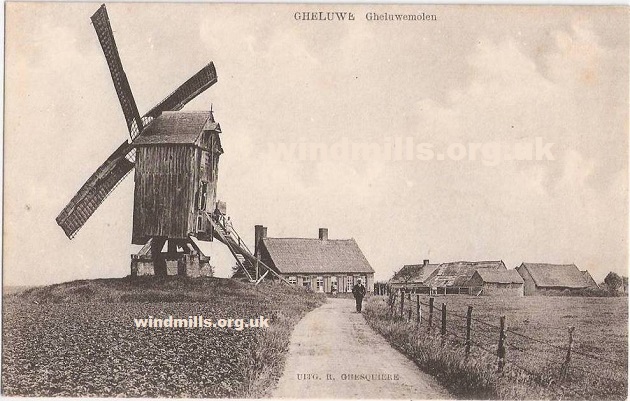 An old picture postcard of a windmill in Gheluwe, Flanders, Belgium. This was posted in 1912 to Posen, Germany. This entry was posted in Old Images, Uncategorized, Windmills and tagged mill, old photograph, postcard, windmill on February 14, 2014 by Tower Mill.